YOUR MAGIC LAMP HAS ARRIVED! Do you remember the story of Aladdin and the Magic Lamp? A young boy named Aladdin finds a dusty old lamp lying discarded on the ground. He picks it up, looks it over, and starts to rub off the dirt, when suddenly a genie appears before him. The genie, who's been living inside the lamp for ages, just waiting for someone to finally come along and release him, tells Aladdin that he will grant him three wishes - whatever three things his heart desires most. As a kid, I believed that, like Aladdin, I might find my own lamp someday. I'd spend hours imagining what three things I would ask for if I found such a lamp. A pool ... a pony ... my own island ... they changed all the time. Of course, as time went on, I gave up on my childhood fantasy. There was no lamp, no genie, no magical granting of three wishes. That's not the way life worked. Now, I'm not writing this letter to let you know that there actually is a magic lamp out there waiting for you to find it, rub it, and release your genie. Not exactly. But the fact is, you're constantly coming in contact with people who have the knowledge, resources, money, connections, wherewithal, understanding, and ability to give you whatever you want - your own personal "genies." If I can take you back to the story for just a moment longer ... remember that Aladdin had to rub that lamp three times in order to break the spell so that the genie could come out and grant his wishes? Likewise, there's something very specific you have to do to get the "genies" that inhabit your world to give you what you want. Something that, if you haven't learned how to do it right, can be extremely difficult - if not impossible. But that, once you've mastered it, will enable you to get all the things you want right now, and open doors to treasures you didn't even know existed. You can get anything you want. Let me clarify that. You can get everything you want. Not just three wishes, but dozens ... hundreds ... as many as your imagination can accommodate. And all you really have to do is ask. Before you write this off as too obvious, too simple, or too pie-in-the-sky to bother with, I'd like to propose something else. Something you may never have really thought about before. Asking is more than a mere action. Asking is a skill. We all know that the only way you ever get anything is by asking for it. What very few people every realize is that they can learn how to ask better, more powerful, more effective questions that are more likely to get them what they want. Like any other skill, asking can be mastered. Even perfected. People who have mastered the skill of asking get the dream jobs, big salaries, harmonious households, loving families, great bargains, prime seats, key information, insider's advice, positive attention, cooperation, trust, affection ... in short, anything they decide they want. People who disregard, undervalue, or ignore this skill settle for less in life. 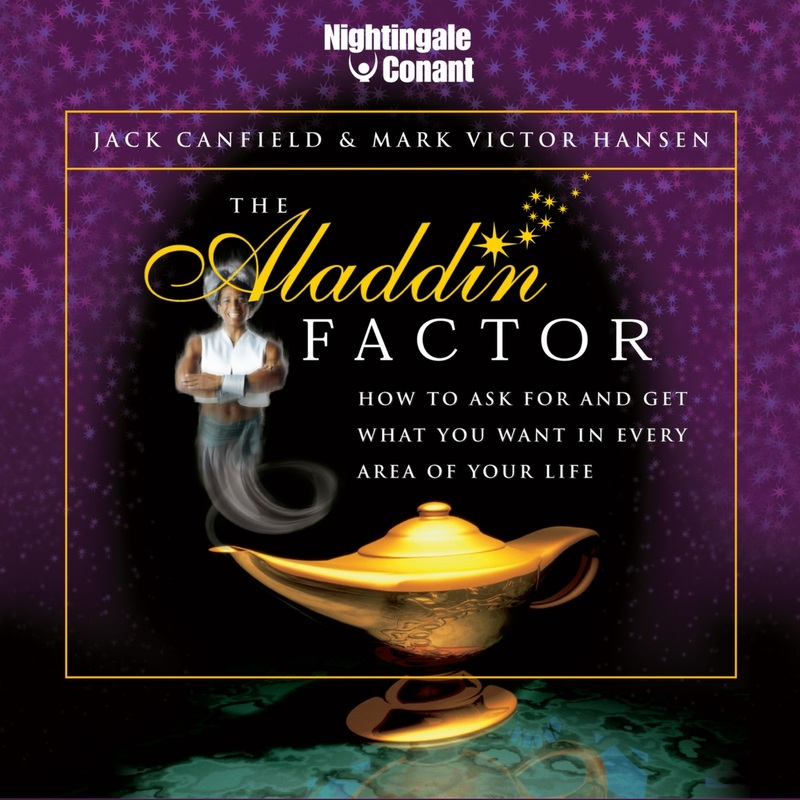 The Aladdin Factor: How to Ask For and Get What You Want in Every Area of Your Life, by Jack Canfield and Mark Victor Hansen. just by learning the right way to ASK for it. Before we continue, there's something I've got to ask you. It's a rather blunt question, but please don't take offense. Are you crazy about your job? Do you get excited to get up and do it every day? Do you have terrific, enthusiastic, dependable employees ... or a boss that recognizes your talent and supports your career? Are you getting the salary you deserve? Are your relationships with your spouse, kids, parents, friends, and co-workers exactly the way you'd like them to be ... or are there little resentments, things you wish they'd do differently, feelings you can't get across, frustrations that have built up and not gotten resolved? Do you have as much money as you need to do the things you love to do ... or as much time to spend doing them? Do you get the treatment you want - not the treatment you expect, but the kind you want - when you're out at a restaurant, on the phone, or buying something in a store? Do you feel that your dreams are within your reach? I'm talking about the big ones, your highest hopes, the things you've always wanted to do. Do you believe - truly believe - it's possible that one day you'll make those dreams come true? These blocks are often deep-seated, rooted in childhood and reinforced throughout our lives. And more often than not, we don't even realize they exist. Conquer the pride that keeps you from asking for things like for assistance, advice - even directions! Once you've identified and defeated the barriers that stand in your way, you'll be primed to reach for the riches that lie beyond. Being ready and able to ask is essential. But it's only the first step in the process of becoming a powerful asker. The next step is learning how to ask ... who to ask ... and what to ask for. The Aladdin Factor takes you step by step through the process of developing effective asking skills, by introducing you to the Eight Principles of Asking. These are the eight principles that separate the "haves" from the "have-nots". The steps that make the difference between frustration and satisfaction ... between wanting and getting. Master them, and you will be able to ask for and achieve anything you want. Locate individuals who are qualified and motivated to give you what you want, instead of wasting your time and questions on people who can't help you. And they illustrate each principle with real life stories of ordinary people who've used it to achieve extraordinary results. In fact, The Aladdin Factor is full of true stories that will inspire you, motivate you, open your imagination to the possibilities that are out there, and make you realize that you really can get what you want, no matter how small or big, just by asking for it! You'll hear about people who asked their way to a multi-million dollar real estate enterprise ... a year's worth of living expenses in order to write a book ... the successful adoption of a beautiful baby boy ... the means to provide food to seven starving families for a month ... free plane tickets and hotel suites ... money to build their dream house ... a more equitable marriage ... the wife of their dreams ... a cure for their child's disease ... and so much more. You'll hear about some of the most magnificent askers of all time - Mother Teresa, Gandhi - and the tremendous requests they made and were granted. You'll discover the Seven Characteristics of the Masters of the Lamp, and learn how to adopt them to become a Master yourself. You'll learn how to ask for what you want and need in every conceivable situation - at home, with your kids, at work, with friends, with service people, even strangers. You'll also learn what not to ask, and how to avoid the least effective but most common asking techniques. Most importantly, you'll learn how to ask yourself the right questions. Questions that will clarify your desires, uncover your life's purpose, focus your journey, and change your life. So... what do you want? A hug from your spouse at the end of a long day? A really great recipe for chocolate chip cookies? The capital to start your own business? Your kids to clean up their rooms without grumbling? The best table in the house when you take your clients to dinner? A body that's 20 pounds lighter? A fair deal from your mechanic? A house on the ocean? A life that's less stressful? More play time? Flying lessons? A whole new career? If you know what you want, The Aladdin Factor is going to teach you how to ask for it and get it. If you don't, The Aladdin Factor is going to show you how to figure it out. And be warned: once you realize how many things you are able to get simply by knowing how to ask for them, you're going to experience an unprecedented sense of exhilaration, freedom, and possibility. Become a "Master of the Lamp"
Start asking for and getting everything you want ! The first time I read through the proposal for The Aladdin Factor, I couldn't believe how many things I'd missed out on ... and was still missing out on ... simply by not asking for them. Things that I was afraid to ask for, didn't realize I could ask for, or didn't even know I wanted. It's a realization few people ever have. And that's a shame. Because few skills, once mastered, are so easy to do and so incredibly, universally life-changing as the skill of asking. You want to stop missing out and start living the life you dream of and deserve, don't you? Well then, I urge you to accept my invitation to hear the program that will put the power of asking in your hands - The Aladdin Factor. Don't spend another day settling for less than you want and deserve. Learn how to ask for the life of your dreams - and get it. collectively sold over 50 million copies worldwide. before someone finally answered "Yes!" ask specifically, and ask until you get exactly what you want. In The Aladdin Factor, they'll teach you how to do the same thing. I want to start getting more of what I want fast... in my career, my relationships, and every other part of my life... just by learning the right way to ASK for it. Please send me the extraordinary audio program The Aladdin Factor for the special price below. I can select one of two ways of ordering.